Whether you are an adult or a child, there may be an occasion in your life where you need a cape. A costume cape can be expensive to purchase or rent and might look cheaply made. A king-style cape can be used for school plays, Halloween costumes, theme parties or any occasion when you need to dress as royalty. You can make your own king-style cape out of plush, royal fabrics in this simple, no-sew project. Fold your velvet in half lengthwise. Measure 6 inches in from the folded side on one of the short ends and make a mark at this spot with a fabric marker. Place a ruler at the outer, unfolded corner of the opposite short end of your velvet. Make a straight line with your fabric marker connecting this corner to the mark you made. Cut along this line with scissors. Unfold your fabric and place fray-preventing gel along all of the raw edges of the velvet to protect them from fraying. Allow the gel to dry for about 15 minutes. Measure the shortest end of your velvet; this is the side that goes around your neck. Make a mark with the fabric marker at the center measurement of this side. Fold your double-fold bias tape in half so the short ends touch and make a mark where the center fold falls. 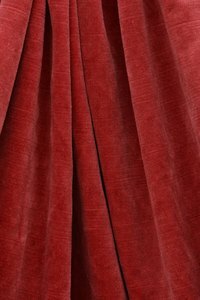 Place a line of fabric glue on the edge of the front and back sides of the velvet. Wrap the bias tape over the raw edge so it encases the front and back of the velvet and the center marks line up. The remaining bias tape will extend beyond the edges of the velvet and act as tie; place glue in the fold of the bias tape and press together to secure it. Apply fur trim to the edges of your cape. Secure it with a layer of fabric glue. Hold the fur trim in place for 30 seconds and then place a heavy item on the trim for about an hour until the glue is dry. Tie your cape around your neck to ensure it looks and fits the way you want it to.